everything you need to know is right there in that pic. if you dont wanna pay for a carbon fiber one just make one outta fiberglass.you can use almost anything for the core honeycomb (ala carbonfiber),1/4"finished plywood, hell ive even helped somebody build one with a piece of 1/2" clear plexi glass. the turnbuckles you can get at home depo/ lowes ect. 4" past the bumper is about as far as you wanna go, although, most sanctioning bodies will limit you to around 2"
I have seen a wooden one painted black on a civic. 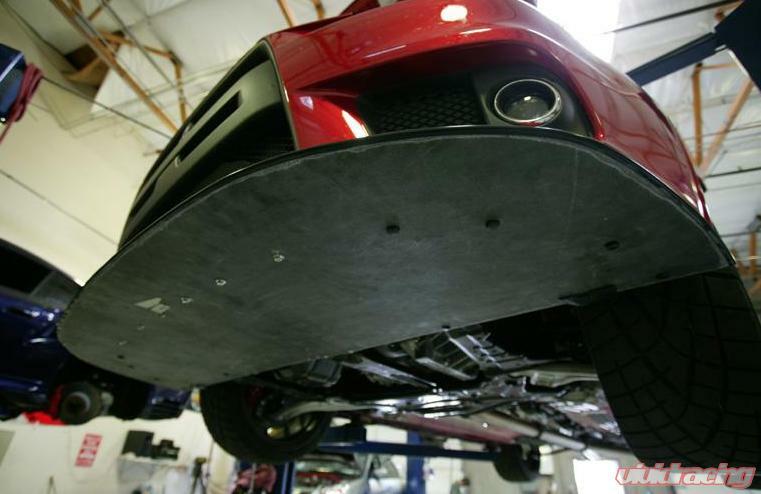 However you make the splitter, via plywood coated with fiberglass, etc, make sure you attach the rear of it to a "hard part" of your vehicle, aka the frame, or something that wont be prone to flexing and cracking like some of the bumpers will do. Plus if the splitter is set up ridgid, you will not have any issues with aerodynamic inconsistencies since it'll stay in one place. For added "tuning" you could make up brackets for the back that work on the same principles as the turnbuckes on the front, so angle could be adjusted if necessary. If we made it by ourselves,I think it is just a medel,mini one. My Custom Homemade Kit is Done! PICS!